It is time again for Classic Gold Key Comic Theatre, where we act out the dialog of a classic Gold Key issue. 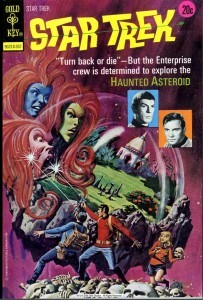 This time, we have Star Trek #19, “The Hijacked Planet”. If you have interest in being a part of this episode, please notify us and let us know who you feel the need to play. We can either perform the parts live and altogether (which is more fun), or you can record your parts and mail them to us and we will edit you in. Attendees of the live recording will be welcome to join in on the post recording discussion to dissect the story. Please take a moment and review the cast of characters and let us know if you are interested in. CLICK HERE to review roles and watch previous episodes!